Well-known and acclaimed photographer Nasir Ali Mamun, who has been working for four decades now, has taken photos of Sydney Poitier and even Hillary Clinton when he happened to be at the White House in 2009. He also has a portrait of Lech Walesa, the Polish leader. His work has carried him across the globe and brought him into close contact with the biggest names in the creative arts. The result of these associations can be seen in a week-long exhibition called 'His Light, His Shadow' which ends today at the Bengal Gallery of Fine Arts. 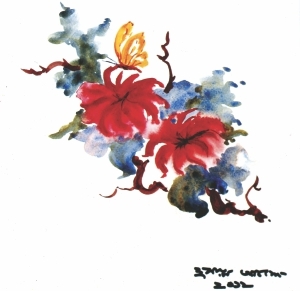 Today he is proud to have a painting of exotic flowers done in magenta, ruby-red and orange which he asked Humayun Ahmed, the recently deceased writer, to paint before his death. The colours had a life of their own. Similarly, he even persuaded well-known poet Shamsur Rahman to paint and the result is that he has 30 artworks by the poet, a collection no other gallery can boast of, he says. He specialises in portraits and sometimes brings in nature, when the artist or writer can go in for it. Mamun got SM Sultan, Quamrul Hassan, Zainul Abedin to write and draw for him instead of just giving him their autographs. He spent nine years with SM Sultan, before he wore his black city garbs and his crown of jet-black ringlets. Sultan enjoyed the meals by his wife Najma and according to the couple, the iconic painter was not quite so bohemian in those days. The drawings and paintings are manifestations of a personal relationship between Mamun and the famous people. None of the paintings or drawings including the ones by Shahbuddin and Monirul Islam have been bought. “I got these drawings, while they sat for their portraits -- as in the case of Zainul Abedin and Quamrul Hassan,” said Mamun. He used his scribble pad as autographs of sketches and paintings. He hopes to accomplish his dream of having his own museum in Savar within five years, an institution that will feature 101 artworks of 37 artists and the artefacts that he could get his hands on, along with photos and other memorabilia -- letters and pages from the diary of the celebrities. Well-known Indian artists whom he met overseas, like Ganesh Pyne and Sunil Gangopadhyay gave him their paintings as souvenirs. In 1995 he met Purnendu Pattrea and took his intimate portraits in New York. He drew a woman, beat and tree -- in the most buoyant colours such as vermilion and jade. The film-maker Mrinal Sen's painting is also in his collection. Way back in 1971 he came across a Muktijoddha, who was once a prisoner of war and was returning home to India to be with his family and friends, and asked him to draw a flower, a simple thing from nature. KG Subramanyan made a realistic goat and acrylic on paper. Mohammed Kibria drew “A Rain” in blue lines, dots and squiggles. He has portraits of women with facial details from Hamidur Rahman, Aminul Islam and Murtaja Baseer. Abdur Razzaque left him a sketch of 'Buriganga' in pen on board. Mrinal Sen and Mustafa Manwar gifted him with trees, clouds and a river for fun, in pen and ink. Rokeya Sultana gave him a portrait of an old man in winter while Shishir Bhattacharya gave him a picture with a human, paper boat, doves and plants. Enjoy fun-filled activities with Santa Clause on 25 December from 1pm to 7pm at the hotel lobby, among the beautiful, decorated Christmas trees. Water Garden Brassiere -- Radisson's all day dining restaurant -- will have special scrumptious buffet lunch and dinner at Tk.2950++. Sublime, their signature restaurant, will offer a quite romantic yet 'Christmassy' six course dinner including a glass of special drink @ Tk.3999++. Spice & Rice, the hotel's restaurant, which specialises in Bengali and sub-continental cuisine, will have a five course dinner menu @ Tk.1950++. 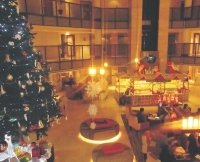 Also available are Special Room Packages on Christmas between 23 and 25 December, 2012. On 25 December, The Westin's Grand Ballroom will host the Christmas Kids Party, presented by Westin Kid's Club. The party will include a Kids' fashion show, Kids' DJ, Kids' movie shows, magic show, puppet show, Snake-ludu, Christmas carols, delicious sweet and savouries, goodies and Santa will be there with lots of gifts. 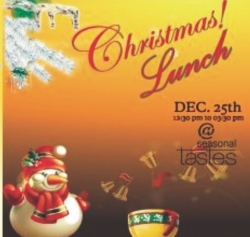 Apart from this, The Seasonal Tastes will host the “Christmas Special Lunch” on 25 December from 12pm to 3.30pm. Splash, Treats and Prego will also have their special Christmas special arrangements. 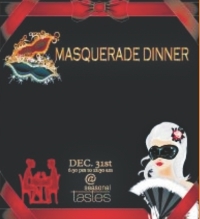 For the upcoming New Year, Seasonal Tastes will be hosting, for the first time ever in Bangladesh, a New Year's special -- “Masquerade Dinner,” from 6.30pm to 11.30pm. Guests can enjoy this exciting dinner with their loved ones and family members. Besides these, there will be an arrangement for New Year's Eve parties, which will take place at the Splash and The Westin's Grand Ballroom. Celebrate the last Friday evening of the year at Mermaid Café with music by Pandu, Jibon, Saad Chowdhury and others. If you want good Jazz, this is the place to be on New Year's Eve. You will be able to order your own choice of food from the regular menu. There is no entry fee. Dhaka Comicon is Bangladesh's first-ever comic book and pop culture convention. It is a two-day event for fans to gather and have fun. The first comic-cons in the U.S. were organised by groups of fans, started small, then became huge as more and more people showed up each year. Similarly, Dhaka Comicon is being organised by a group of fans who dreamt of a comicon in Bangladesh, and they expect it to get bigger and bigger, year after year. Collector's Exhibition: An exhibition showcasing 60+ years of comic book and pop culture toys and collectibles. Art Contest: Look at, and vote for cool fan artwork, ranging from paintings, dioramas, and custom action figures. Merchandise: Browse and buy merchandise for sale including comics, T-shirts, and action figures from Saadi's Collectibles, Jamil's Comics, RollOut, SRK Showtime, Dhaka Action Figure Shop, Scavengers, etc. This event is presented by Samdani Art Foundation. Conditions apply. EventCraft has organised a Doubles Badminton Championship, one that is open for all university students. Registration fees: Tk.1000/team. To register or for more details, log onto: www.sites.google.com/site/eventcraftdb. 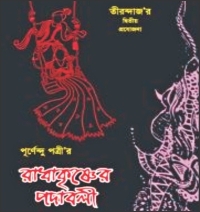 Bangladesh Shilpokola Academy is organising the very renowned play Radha-Krishner Padaboli. 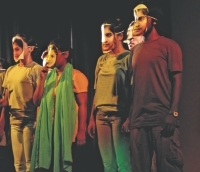 A Teerondaz production, the play had been scripted by Purnendu Potri and directed by Deepak Suman. A must-see for theatre lovers. Celebrate the New Year with Regency as they present “Temptation New Year Celebration,” a strictly 18+ event. Spend the whole New Year's Eve with brilliant music, fashion shows, good food and great friends. Tickets available from www.blackeyegroup. com; for more information call the ticket hotline, 0171 214 1718. This is a year-ending concert to celebrate music on a holistic level, as Live Square is bringing in musicians from all spheres and genres. Although it's on a weekday, the organisers hope to start the proceedings by Monday afternoon and wind up the affair by 10pm. Many people miss out on the fun and frolic of a 31st for various reasons, but this event will present the opportunity for all to come together and have fun with friends. 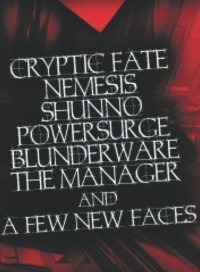 It will be a year-end blast with the best bands in town. Be there or be square. Tickets: Tk.200 with a merchandise/gift. 'AmraMalala' is the third of a series of six new choreographies that Shadhona is creating with the support of the EMK Center. The show will be highlighting issues that women face in South Asia in light of recent events in Pakistan where Malala Yusufzai, a 15 year old student and activist, was shot this October. This performance is inspired by Malala and is also an occasion to reflect upon the role women play in achieving peace. Following the core production, there will be a segment based on a 'Call for Performance' for other performers to present a prepared piece. The EMK Center is a joint initiative of the Liberation War Museum and the American Center of U.S. Embassy Dhaka.